In the second pAsuram, AzhwAr says “If there are any hurdles, you should yourself eliminate them and accept me at your divine feet”. sIRA eriyum thirunEmi valavA! dheyvak kOmAnE! sERAr sunaith thAmarai sendhI malarum thiruvEngadaththAnE! thiruvEngdaththAnE – Oh one who is residing in thirumalA! Oh omnipotent emperumAn who can control the shining chakra which cuts the cruel, very strong demons into pieces, to turn them into dust, and which shows its anger even after flattening them and which is having the wealth of valour! Oh lord of nithyasUris! Oh one who is residing in thirumalA which is having muddy ponds with reddish lotus flowers which have the complexion of reddish fire and which are blossoming! Kindly bless me who is a servitor, having ever endless love for you, to reach your divine feet. kURAy … – What is the match between your hand being inseparable from the chakra and I still having my hurdles? emperumAn‘s divine weapons which are indestructible, would destroy all his (AthmA‘s) hurdles and uplift him; they can also eliminate the hurdles which are caused by emperumAn himself. vishNu dharmam 70 “rakshanthi sakalApathbya:” (protecting from all dangers); he [emperumAn] himself is included in this word “sakala” (all). Now, sins are the result of his anger over the AthmA due to the defects in the AthmA; these weapons are capable of eliminating even such hurdles. The reason for this is because they (weapons) keep thinking about emperumAn’s initial mercy towards the AthmA. These weapons were previously told by emperumAn himself “Even if I see some faults in these AthmAs and manifest my anger towards them, you don’t abandon him; you see my initial, natural mercy towards him and protect him due to that”. The chakra is explained as in thiruviruththam 33 “aruLAr thiruchchakkaram” (the divine disc which is filled with mercy). They (weapons) would have seen his initial mercy and hence even if he changes his position towards the AthmAs, the weapons would not change [and continue to protect them]. This is why, those who were bestowed with his mercy, would consider the sharpness of his divine chakra as their refuge. kUrAy nIrAy nilanAgi – His divine arrows which act as said in SrI rAmAyaNam yudhdha kANdam 94.22 “chinnam binnam Sarair dhagdham prabagnam Sasthra pIditham” (They saw the army of rAkshasas who were cut, blown away, burnt and destroyed by the arrows of SrI rAma), have guNa (guNa means the String as well as mercy). Unlike those arrows, his chakra is most cruel. [While the arrows will cut the entity into portions directly] the chakra will cut it into two pieces and then will turn the entity into dust and finally will make it disappear as well. Agi – Implies both making and to become. kodu val asurar – This is the reason for his anger. Those demons who act in a cruel manner and who are very strong which makes it impossible for anyone to defeat them. kulam ellAm – Just one person’s mistake makes the whole clan to be destroyed and hence emperumAn destroyed the whole town along with the residents. Whether it is the favourable ones or the unfavourable ones, no one escapes his curly chakra. As said in thiruviruththam 70 “vaLaivAyth thiruchchakkaraththengaL vAnavanAr” (our lord in paramapadham who has the curvy and rounded chakra) – only after being caught in his chakra, AzhwAr was uplifted. What was the reason for his act to cut the demons and finish them? sIRA eriyum thirunEmi valavA – Even after completing the tasks, his chakra will shine continously like a snake which has not found its prey. thirunEmi valavA – While you are carrying the divine chakra on your right hand, I am [still] carrying agony [how do these two match?]! dheyvak kOmAnE – Such emperumAn who takes up so much care/suffering to protect his devotees, is not without any support. 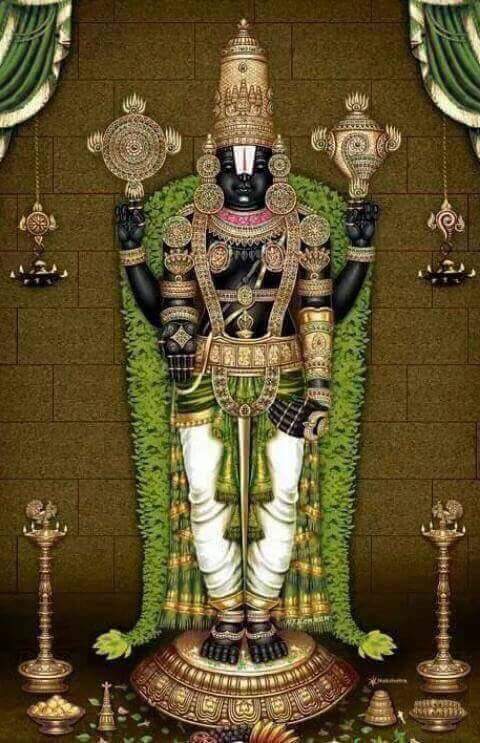 He is as said in thiruvAimozhi 1.1.1 “ayarvaRum amarargaL adhipathi” – lord of indefatigable nithyasUris. There (paramapadham), only those who enjoy his beautiful combination of hand and chakra are available; but it is here (samsAram) that he has people to be cut into two pieces. Only his divine chakra rules both the realms. As said in thiruviruththam 33 “agal visumbum nilanum iruLAr vinai kedach chengOl nadAvudhir” (You are having your sceptre which eliminates the darkness and rules over the spiritual sky and the material world); the chakra rules over everyone there (paramapadham) with its beauty; it rules over everyone here (samsAram) with its sharpness. Sharpness is subdued there; beauty is subdued here. For those who are there, just its presence on his hand will uplift them; but for those who are here, only after eliminating the enemies, they will be uplifted. Those who are there always depend upon his hand (him), but here people don’t have such faith. sErAr sunai … – In the muddy ponds, lotus flowers blossom like reddish fire. AzhwAr is desiring to enjoy water-lamp instead of oil-lamp. The reddish lotus flowers appear to be fire on top of water! ARA anbil adiyEn – This [love] is AzhwAr’s identity. Only when the water dries out in the pond [which never happens], will AzhwAr’s love dry out. This love originated from emperumAn‘s blessing of unblemished knowledge and devotion. The love which does not wait for any rules. un adi sEr vaNNam aruLAyE – You should bestow your mercy upon me to have me engaged in service at your divine feet. See that the purpose of your standing in thirumalA is fulfilled! See that my love is properly fed! This entry was posted in thiruvAimozhi, thiruvAimozhi 6th centum on June 15, 2018 by Sarathy Thothathri.